Chatbots provide the benefit of allowing the existing agents to be able to do more by automating some of the simpler interactions and creating new capabilities or provide services that did not exist previously. But how do you go about it? "Fast followers of chatbots are experimenting with proof of concepts and pilots with internal audiences. This year, we are seeing an uptick in HR organizations implementing Proof of Concept and considering production deployments" −− Rajesh Attra, Managing Director, Deloitte Consulting. Organizations across the world are increasingly exploiting artificial intelligence, machine learning, and natural language processing to drive their digital transformations journey. This is more so because customers employ next-gen technologies to connect with enterprises. So much so that 85 percent of customer interactions within an enterprise will be with software robots in five years’ time and that 87 percent of CEOs are looking to expand their AI workforce using AI bots, according to a study by Forrester. As a matter of fact, most of these decision makers fear they are lagging behind their competitors in the use of AI to improve the customer experience. And to catch up, almost half (49 percent) plan to increase their AI budgets, says the study, by at least six percent in the next 12 months and 87 percent intend to expand their AI workforce. Robotic Process Automation (RPA) and chatbots are two technologies that can open up new opportunities for organizations by streamlining processes and tasks previously performed manually by humans. “Businesses across industries including insurance companies, banks, and telecoms are among the earliest adopters as they are sizable incumbents with large customer bases facing cost pressures alongside disruption threats from startups,” says Rajesh Attra, Managing Director, Deloitte Consulting. High attrition industries including finance, retail, and healthcare are also ahead in terms of bracing for the new age technology. The interesting part is that chatbots come with different abilities to fulfill a different purpose in each industry. Van Baker, Gartner's Research Vice President for Application Innovation team, predicts that by 2020, over 50% of medium to large enterprises will have deployed product chatbots. The technology is also seen as perfect fit when it comes to human resource processes such as recruiting and employee onboarding and training. A recent survey of 350 HR leaders conducted by ServiceNow, an enterprise automation solutions company, finds 92% of HR leaders agree that the future of providing an enhanced level of employee service will include chatbots. The HR management is always burdened with the tasks of engaging with the employees, redressing their grievances, conducting surveys and taking feedback. The mass personalization – the ability to personalize information based on each user and tailor the conversation to them, is a clear benefit of bot for HR. Proactive engagement, the ability to reach out with reminders or via prompts to achieve outcomes (e.g. your compliance training become due) also offers a strong use case for HR bots. “Fast followers are experimenting with proof of concepts and pilots with internal audiences since internal use is deemed less risky for experimentation than external facing chatbots. This year, we are seeing an uptick in HR organizations implementing Proof of Concept and considering production deployments,” adds Rajesh. 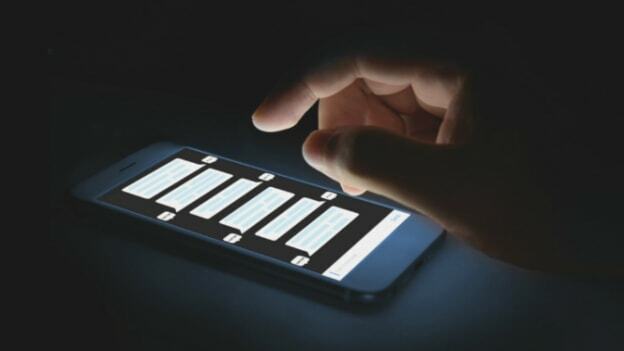 Recently, global cloud major Oracle has launched a chatbot called Digital Assistant that can leverage the power of AI to automate routine tasks pro-actively. This is an example of how HR chatbots can become enablers. The time is not far when robotic software will be used to help employees check their HR records, book holidays, or view their performance reviews doing away with the manual effort. 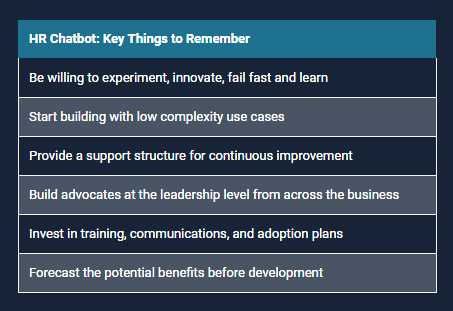 The good part is that with RPA, the bots or software can reduce error, improve employee morale, and more importantly help enhance decision making while adding to efficiencies and process improvements. Of the 250 “cognitively aware” organizations, or early adopters, surveyed in the 2017 Deloitte State of Cognitive Survey, 59 percent are exploring mature cognitive technologies such as RPA. It isn’t easy to calculate ROI, because the benefits can be intangible assets. However, a study by Juniper titled “Chatbots: Retail, eCommerce, Banking & Healthcare 2017-2022” forecasts that chatbots will be responsible for cost savings of over $8 billion per annum by 2022. This is a huge uptick from the $20 million that employers are expected to save in 2017–18. “Chatbots provide the benefit of allowing the existing agents to be able to do more by improving order interactions while automating some of the simpler interactions. They are also being deployed to create new capabilities or provide services that did not exist previously. This is resulting in greater productivity for the agents,” argues Rajesh.” How do you monitor the performance of bots then? 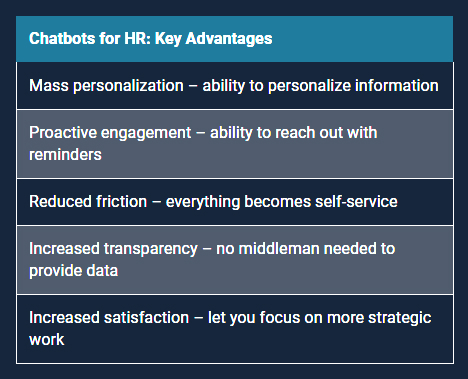 Key metrics of HR bot performance, as Rajesh points out, include productivity savings, reduction in customer wait times, improvement in resolution times, improvement in customer satisfaction, increased engagement, increase in throughput, reduction in escalations, adds Rajesh. Enterprises need to look at their opportunities, challenges, and/or deficiencies in current HR support models. They need to have a clear understanding of the marketplace to determine the right automation technologies to support the enterprise. Organizations need to execute on the vision for user experience in order to determine how automation can support it, according to Rajesh. Decision makers should also look at the tech-readiness of the stakeholders as well as the team leading the implementation (IT, Information Security, HR primarily. Extending to Finance, Procurement, Line of Business leaders as needed to support use cases). As more and more players are entering the market, organizations need to evaluate vendors based on their industry/function expertise. Jagan Jami, COO of Acuvate – a chatbot solution provider, suggests "it is important to look for certain capabilities in a platform. This includes the capability of integration of AI, Natural Language Processing and Machine Learning and ease of maintenance. The cognitive abstraction, which allows you to not get locked down to any solution and change to a better service in the future." It’s imperative to outline clearly the scope of services chatbots will and will not deliver. Involvement of HR is important in defining these use cases to serve employees better. Chatbots must be able to provide accurate information and they need to be connected to the company’s HR platform and be able to fetch the right data. There’s nothing particularly skillful about a system that can only provide a binary answer, and employees don’t want to ask 20 questions to get the information they need. The best approach is to build decision trees directly into the chatbot software based on frequently asked questions and to make sure these are continuously updated. Chatbot privacy and security are two areas which organizations should pay close attention to. "Ensure chatbot solutions are compliant with GDPR or any industry-specific or location-specific policies and regulations. It’s also critical to ensure the chatbot provides information to users based on their authorization levels," suggests Jagan. It’s important for organizations looking to add HR chatbot technology to do their due diligence before deploying one. “If not implemented well, chatbots may drive discontent which forces users to traditional channels and may prevent those users from ever adopting or trusting future iterations,” according to Rajesh. And if not supported well, chatbot answers, guidance, and insights may be out of date or incomplete which can drive noncompliance, rework, and dissatisfaction. So, it's important to understand your culture and build appropriate adoption and engagement plans. Spend time to understand the end to end process and what great experience you want to create for your employees. Enterprises using traditional on-premise HR management systems must ensure their information does not leave their corporate firewall. All HR data should be encrypted. Depending on your enterprise’s security requirements, HR professionals should look into an on-premise, hybrid, or cloud deployment models for HR chatbots. Lastly, to ensure your enterprise chatbots initiative does not fail, be willing to experiment, be willing to innovate, be willing to fail fast and learn from failures and issues, concludes Rajesh. To learn more on how organizations are gearing up to leverage Chatbots for HR and overcome challenges of implementations, join us for People Matters TechHR Conference on 28th February 2019 at Marina Bay Sands, Singapore. Register Now!